Manish Vij is the co-founder of Quasar Media, an integrated online interactive agency. Prior to starting Quasar Media he worked with India’s largest portal, Rediff.com, for over 5 years. 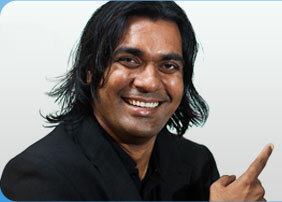 He has been recognized as one of the prominent online media professionals in the country. In the last two years he has also co-founded Tyroo.com, India’s second-largest fully self serve ad network, Zoomtra.com – a Travel meta search and incubating entreprenuers with ideas on digital business under the group name of Smile Interactive Technology Group. In this interview, Manish explains about Quasar’s business models, the advantage online media agencies have over tradtional advertising agencies and the challenges in advertising via blogs. Helen Shukla is the founder-director of The Writers Block, a Bangalore-based company that focuses on technical documentation outsourcing and consulting. In this interview, Helen talks about the state of technical documentation in India, what skills are required for the job and how her company aims in filling the demand for quality writers in India. Sudhakar Gorti is a co-founder and CEO of Proteans Software Solutions, an outsourcing company based in Bangalore that focuses on product development using Microsoft technologies like .NET. In this interview, Sudhakar talks about opportunities in outsourced software product development and how his company created a niche in this segment. Jay Pullur is the founder and CEO of Pramati Technologies. Here, he discusses how he set out on his entrepreneurial path with Pramati, and the company’s latest desktop platform product, Dekoh, recently featured on TechCrunch.